Floorex are proud to offer a unique service that allows you to re-use exhibition carpet for multiple exhibitions and displays*. We lay, lift, clean and store the exhibition carpet at our premises ready for you to call at any moment helping you make a substantial saving. After the event the carpet comes back to our warehouse and is thoroughly inspected, cleaned and repaired and is then categorised into either exhibition use or cut into room sizes and sold off through our retail outlet. This means Floorex Carpets can offer its customers a reduced price for recycled carpet and being green at the same time. 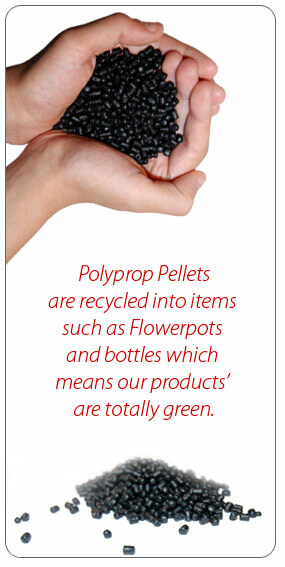 Finally once it has no further exhibition use it is made into Polyprop Pellets and recycled into items such as, flowerpots and bottles which means our products are totally green as we work with local companies to help reduce our carbon footprint even further. *For the life of carpet – depending upon wear. In addition to turning our Ex-exhibition carpet into Polyprop Pellets, we have recently undertaken an additional recycling scheme. 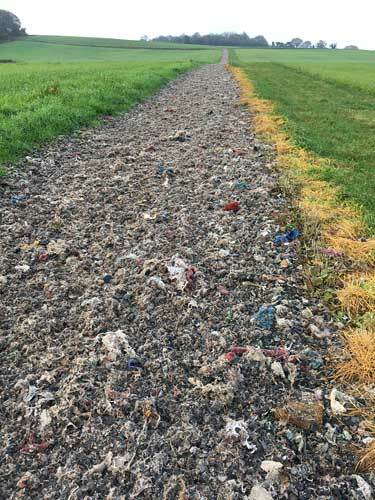 Our exhibition cord is now also being used and mixed in with other used household carpet for all weather horse gallops all around the UK. Due to the material makeup the carpet gallops reduce the risk of injury to the horses being trained.